This past weekend saw the kickoff of the 2017 Club Series, as the vast majority of Sectional tournaments took place around the country. Check out the complete list of who advanced to Regionals after this weekend’s action. In the Men’s division, two of last year’s Club Championships qualifiers were required to participate in their Sectional tournaments after choosing not to attend a second named Triple Crown Tour event, which likely would have meant a flight to Colorado for the Pro-Elite Challenge in early July. 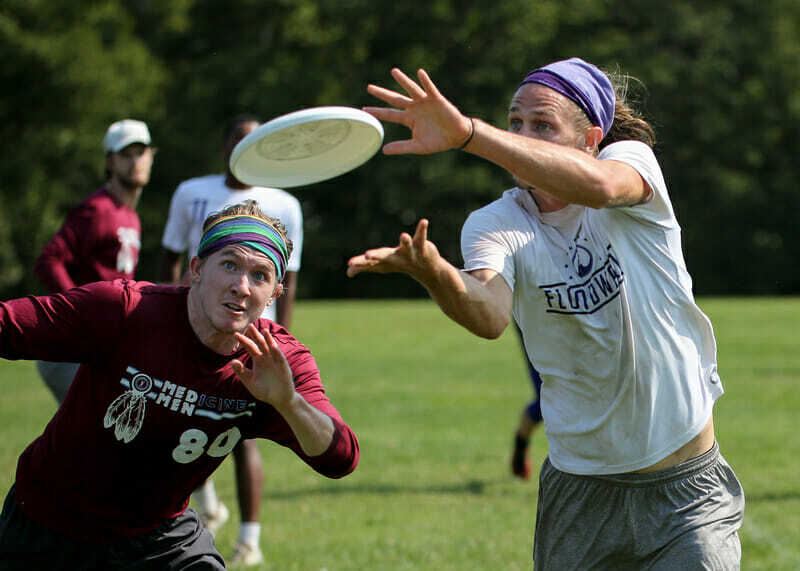 #2 Raleigh Ring Of Fire rolled though the competition at North Carolina Sectionals, their closest game a 13-11 win over Triangle Cash Crop. Similarly, #11 Boston Dig were part of an emphatic Boston Sweep 2.01 at East New England Sectionals, though new team Boston Baked Beans — filled with aging stars like Jared Inselmann, Matt Rebholz, and Jon Hirschberger — proved they could be a threat going into the four bid (!!!) New England Regionals. In the only Top 25 clash of the weekend, #25 New Jersey Garden State Ultimate took down #24 Pittsburgh Temper in the final of Founders Sectionals, furthering the chaos heading into Mid-Atlantic Regionals. With only two bids on offer, Med Men, GSU, and Temper will all feel like they have a legitimate shot at taking down either Truck Stop or Patrol in a game-to-go. Like the Men’s division, Women’s also saw two 2016 Nationals qualifiers in action at Sectionals. Unlike in Men’s, both did not cruise to a title. While #19 Raleigh Phoenix ran away with a 13-1 victory in a single game North Carolina Sectionals, #22 Philadelphia Green fell to Pittsburgh Hot Metal in the Founders final. The teams appear to be lined up for a potential semifinal clash at Regionals where the winner will likely challenge Scandal for the sole Mid-Atlantic bid. #6 Toronto 6ixers looked to be in strong postseason form, giving up a total of two points across two games at Upstate New York Sectionals. They’ll need to continue that momentum at Regionals with only two bids in the Northeast and Brute Squad a near lock. #17 Boston Siege (East New England) and #18 New York Bent (Metro New York) also cleaned up at their respective Sectionals and will be gearing up to battle their Canadian rivals on Regionals Sunday in Devens for a ticket to Sarasota. Elsewhere, #9 Chicago Nemesis (Central Plains), #10 Seattle Underground, #15 Minneapolis Pop (Northwest Plains), #21 Oakland LOL, and #25 Kansas City Wicked (West Plains) were the class of their Sectional tournaments. Only Underground saw a close game, being pushed to 12-10 in the Washington final by Vancouver Sneaky House Hippos. While Oakland took the NorCal title, more importantly, Club Update favorite Deadly Viper Assassin Squad advanced to Regionals and has the potential to get a shoutout in a third Update two weeks from now. Perhaps unsurprising given the division’s historical parity, Mixed saw the most Top 25 teams compete at Sectionals, as 12 ranked squads took the field this past weekend, including four of the top 10. In some of the deepest mixed sections in country, heavyweights #4 Seattle BFG and #7 San Francisco Blackbird were victorious at Washington and NorCal Sectionals respectively, though both were pushed. BFG knocked off Seattle Birdfruit 13-9 in their final, while Blackbird survived a 13-10 final with #22 San Francisco Polar Bears, who then fell to San Francisco Classy, a surprise second place finisher. All three Bay Area squads will have to contend with #24 Los Angeles 7 Figures at Southwest Regionals, who easily claimed the SoCal crown. #5 Boston Wild Card was part of the aforementioned Boston sweep in East New England while elsewhere in the Northeast, Brooklyn Grand Army upset #21 New York XIST 12-10 to take the Metro New York title and claim the first bid to Regionals. One of the buzziest storylines in the preseason was the new Amherst-based mixed team, Happy Valley — headlined by the Tunnell siblings — but the Valley had a less than happy postseason debut, falling twice and finishing second to eke out a Regionals bid. After both notching Sectional titles, #10 Cincinnati Steamboat (East Plains) and #18 Chicago UPA (Central Plains) look destined for a third straight year of battling for the lone Nationals bid from the Great Lakes. In pool play of the West Plains tournament, St. Louis Chalice took down #15 Iowa Chad Larson Experience and went on to claim the section title with a definitive win over crosstown rivals Thoroughbred 15-9; CLX rebounded and claimed the second spot. The Mid-Atlantic is staring at a one-bid region where last year they had three. That’s bad news for Sectional champs #19 Washington D.C. Ambiguous Grey (Capital) and #25 West Chester Bang! (Founders), who will clash with Amp and Alloy — who sat idle with byes to Regionals — in an all-out brawl in Milford, DE two weeks from now. The last ranked squad in action was #20 Durham Toro who topped five in-state rivals en route to the North Carolina Sectionals title. An unexpected second week of Sectionals is on tap for this weekend after a rash of late cancellations last week in response to Hurricane Irma in the Southeast and the wildfires burning across the Western United States. Next weekend will feature Women’s, Men’s, and Mixed Sectionals in the East Coast (SE) and Florida (SE) sections and Mixed play in the Big Sky (NW) section. TEAMS: Baltimore Medicine Men, Boston Dig, Boston Siege, Boston Wild Card, Chicago Nemesis, Chicago UPA, Cincinnati Steamboat, Kansas City Wicked, Los Angeles 7 Figures, Minneapolis Pop, New Jersey Garden State Ultimate, New York BENT, Philadelphia Green, Pittsburgh Hot Metal, Portland Rhino Slam, Raleigh Phoenix, Raleigh Ring Of Fire, San Francisco Blackbird, San Francisco Polar Bears, Seattle BFG, Seattle Birdfruit, Seattle Underground, SoCal Condors, Toronto 6ixers, Toronto GOAT, Vancouver Sneaky House Hippos, Washington DC Ambiguous Grey, West Chester Bang! Comments on "Club Update: The 2017 Series Begins"